Fig. 1- Lace one Rexlace strand through the spring end of a safety pin. Fig. 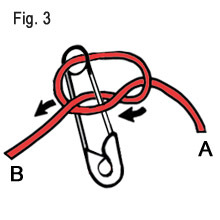 2- Pass strand end A over safety pin and under strand B. Fig. 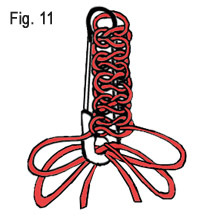 3- Fold strand B under strand A. 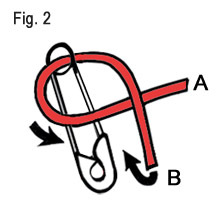 Pass strand B under one side of the safety pin and back over strand A. Fig. 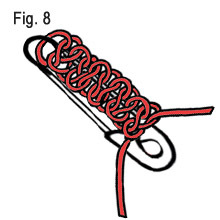 4- Pull both ends to tighten the knot. Fig. 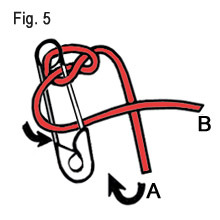 5- Pass strand B back under the safety pin and over strand A. Fig. 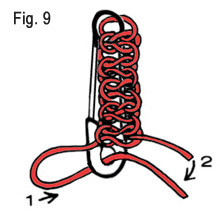 6- Fold strand A up over the safety pin and through the loop created by strand B. Fig. 7- Pull both ends to tighten the knot. Fig. 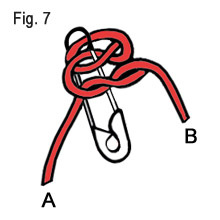 8- Repeat steps 2 thru 7 until the safety pin is full of knots. 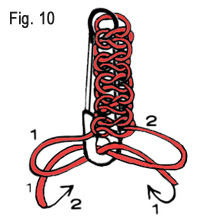 Tie the remaining Rexlace into a bow to form the wings. Fig. 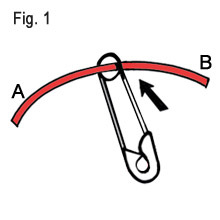 9- With the remaining Rexlace, pass the ends through the large hole in the safety pin. Do not tighten. Fig. 10- Pass the ends through the hole again. Do not tighten. Fig. 11- Tie the ends together. 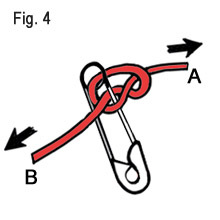 Tighten the knot to the safety pin. 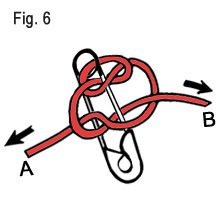 Form a second knot if necessary. Trim the ends to the same length of the dragonfly wings.